House water purification systems from RainSoft provide homeowners with cleaner, more refreshing drinking water at any time with the simple turn of their kitchen faucet. Think of it: Instead of incurring the costly expense and scheduling nightmare of a water delivery service, or continually traveling to the store yourself and lugging home a supply of heavy plastic water bottles, you will have access to bottle-quality water for drinking, cooking, and food preparation in the comfort of your own home – as much as you like, and whenever you want it. As an added bonus, you’ll be helping the environment (because, unfortunately, those plastic bottles would probably be ultimately destined for an already overburdened landfill). 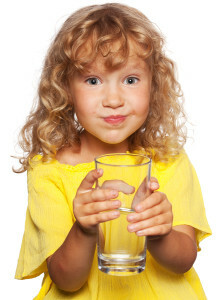 Step 1 – Water is fed into a pre-filter to reduce microscopic particles and additives like chlorine. Step 2 – The pre-filtered water is then forced through a spiral-wound, semi-permeable, state-of-the-art reverse osmosis membrane to remove impurities at the molecular level. Step 3 – The resulting highly filtered water enters a storage tank, where it stays until you turn on the kitchen faucet; then the water is sent through a final system post-filter before being dispensed, clear and sparkling, into your glass. As you can see, RainSoft’s comprehensive house water purification systems incorporate multiple lines of defense to purify the drinking water your family relies on. And because our innovative filter assembly and low profile storage tank can fit into virtually any cabinet space, all of this will happen behind the scenes in your kitchen! RainSoft is pleased to offer house water purification systems assembled in the U.S.A. and Tested and Certified by the Water Quality Association (WQA). The WQA Gold Seal certification provides strong assurance of our products’ quality, durability, and effectiveness. And for even more peace of mind, RainSoft provides expert installation and support, along with our Limited Lifetime Warranty, for all of our products. Contact your local authorized RainSoft dealer if you would like more information about our highly effective drinking water purification systems. With better quality water you can see, taste, and feel, the difference is clear. We’ve been taking the worry out of water since 1953, and we’ll be happy to provide you with more information on a reverse osmosis drinking water system as well as our whole house filtration systems, water softeners, and perhaps an ozone air purifier for your home.